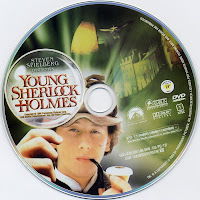 It looked encouraging last night as we began watching Young Sherlock Holmes directed by Barry Levinson. The young friends, Holmes and Watson, attended an English boarding school and the scenery filmed at Oxford and Eton College was delightfully British. Lovely snow-falling scenes in Victorian-era London evoked a Dickensian Christmas. The story was light-hearted and entertaining. Then came the horror. The mystery Sherlock Holmes had to solve involved brutal suicides inflicted by graphic hallucinations and violent murders committed by a freaky religious cult that mummified its victims. There's a rotting zombie cemetery scene that will probably leave ME with nightmares. This PG-13 movie is not for the little ones, and unless your tween can handle Raiders of the Lost Ark and Harry Potter -type evil imagery, don't rent this one for family movie night. Thank you for the review-one less disapointing movie rental! good to know! I hate it when a movie seems kid friendly, but really is not! Hi Sonja, following back. Thanks for visiting. Thanks for stopping by my blog!!!! I really appreciate it. I am new to the blogging world and would love any advice you have to offer. I am following you back!!! I hope you have an amazing day today! By the way, I love your blog!! !